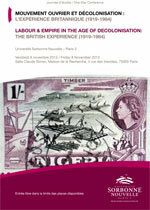 Specialists of the British Empire and researchers in British labour history can no longer afford to ignore each other. According to Bernard Porter and Catherine Hall, the time has come for a social history of the Empire, and one might add – following the stimulating examples recently provided by Stuart Ward and Andrew Thompson – for a social history of decolonisation. In most studies attempting to explain the demise of the British Empire, the world of labour does not stand in the limelight, the key roles being allocated to metropolitan statesmen on the one hand and native elites on the other. Our one-day conference will seek to counter-balance that neglect (as Frederick Cooper and the ‘subalternists’ have already done), by focusing on the role played by the voiceless and their experience, initiatives and organisations, in the dissolution of the British Empire. Marcel van der Linden once declared that ‘the history of the British working-class can only be written as a transcontinental one’ and John MacKenzie has never ceased to strive for a socialisation of imperial studies. Hopefully the conference will confirm that the history of the British Empire, including that of its liquidation, can only move forward by putting common people back on the map. Cette journée d’études est organisée par le laboratoire CREW, Centre for Research on the English-Speaking World (EA 4399), le CREC, Centre de recherche en civilisation britannique, et l’axe 3 de CREW, « Echanges, transferts et constructions nationales dans l’espace anglophone», avec le soutien de la Society for the Study of Labour History. Elle s’inscrit dans la continuité des colloques « La Grande-Bretagne et son système-monde, 1815-1931 » (mars 2010) et « A la redécouverte de la Grande Fièvre Ouvrière, 1911-1914 » (septembre 2011).